The Bloomington Public Library is facing big changes. The nature of those changes depends on who you ask. The Library’s Board of Directors has been developing its own expansion plans for several years, but City Council members and The Downtown Task Force (DTF) have recently proposed a plan to move the library downtown. The DTF wants to combine the Library with a transit center and a new parking deck on Market Street in Downtown Bloomington. In contrast, the Bloomington Public Library Board of Directors envisions the library campus as “a quiet space in a hectic world for interaction, communication, study, and reflection.” The Library’s long-term plan includes expanding its current location and serving as a focal point in Bloomington. Patron surveys revealed that city residents want a new location. Survey respondents also expressed a desire for a larger library with more curb appeal. Safety concerns with the current location and its surrounding neighborhood were also raised. It's unclear if moving the Library a few blocks to Downtown Bloomington is the type of relocation respondents had in mind. The Library’s Board of Directors is considering three conceptual plans proposed by Farnsworth Group, Inc. The Library paid Farnsworth Group $80,500 for the three conceptual plans. Plan 1: Renovation and expansion of the existing building, the addition of a park, and a space for outdoor programming. Plan 2: Renovation and expansion of the existing building, ground floor retail spaces, mixed-use buildings, (an additional?) 35,000 SQFT of civic commons, and ample parking. Plan 3: Selling the existing library and building a new facility further south toward the Constitution Trail. This plan would include the elements proposed in Plan 2 in slightly different ways. The long-term plan would increase the Library’s square footage from 57,700 to 98,765. The Library cites an increase in circulation (82.1% since 2007) and program attendance (28.2% since 2008) as reasons for such a large increase. Bloomington’s current population is expected to grow from approximately 78,000 to over 84,000 in 2035. Using this estimate, Farnsworth Group, Inc. calculated a total of 98,765 SQFT of needed space. The recommendation for such a large increase in space is largely based on industry standards and a planning tool created by the Wisconsin Department of Public Instruction. It is unclear whether the Library is also motivated by metrics from its own research. AdaptBN has prepared a visual comparison between the new distribution of space and the library's current floor plan. The Library would need additional funding ranging from $17.8M to $27.8M to complete such a large project. In the third proposal, which includes selling the current Library, Farnsworth Group, Inc.’s report assumes a selling price of nearly $8M for the current library. This figure is based on a 2010 insurance appraisal. It’s worth noting, however, that insurance appraisals focus on the cost to replace the current building, rather than the market value of the building. While the Library doesn’t recommend continuing to operate without expansion, it did provide the cost of maintaining the current building. If the Library decides not to pursue expansion, it would cost $2M to replace the roof, carpeting, broken furniture, sidewalks, and portions of air conditioning. The Library was last renovated in 2006 for nearly $3M, or $3.7M in today's dollars. While both the Downtown Revitalization Plan and the Library’s Long-Term Vision Plans include building parks and redesigning traffic flow, the proposed locations of the library differ. The DTF wants to make the library a focal point of downtown, while the Library wants to stay in its current location and improve its surroundings. The Library’s plan also highlights the difference in overall vision: DTF is looking for a centrally-located, bustling hub, while the Library envisions a quiet place for patrons to spend time. The Library did not respond to requests for comment. Tom Dabareiner, Former Community Development Director for the City of Bloomington, previously highlighted that the Library’s heavy foot traffic could help reinvigorate Downtown Bloomington. Since the library and downtown projects will both require financial assistance from the city, he suggests combining the two into one large project. It’s not clear how the move to downtown would affect the Library’s traffic or parking. Dabareiner does not believe any of the Library’s proposed plans will boost the downtown area. He further argues that the addition of retail spaces, as outlined in two of the Library’s conceptual plans, would bring competition to current downtown business owners. Dabareiner also stated that library patrons may be less likely to visit the downtown area given the current distance between the two locations. However, the Library is roughly 0.25 miles to central Downtown Bloomington, which many consider to be walking distance. Neither the DTF or Dabareiner highlighted whether the two locations would cater to similar patrons or if Library patrons would be interested in visiting the core of Downtown. The DTF is also concerned about possible safety issues in the Library’s currently landlocked parking lot. Concerns of public safety in the parking lot seem unfounded as the Library is across the street from the Bloomington Police Department’s headquarters. The DTF moved forward with its final report to include the library/transit center project as its tier one catalyst program. However, Alderwoman Amelia Buragas did mention at a public Q&A that more in-depth conversations with the Library are needed before any plans are finalized. Despite the conflicting visions for the Library’s location, the projects do have one piece in common: funding. Both the Library and Downtown Bloomington Revitalization projects require significant funding from local municipalities. The Bloomington Public Library has roughly $2.25M available for funding and believes it can raise an additional $1.5M. Downtown Bloomington’s Revitalization project does not have a clear funding source. 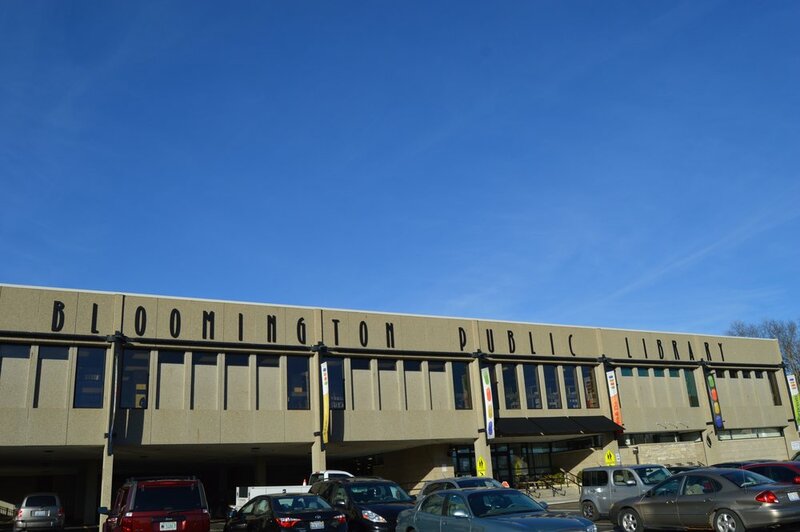 With major redevelopment plans under considering for both Downtown Bloomington and the Bloomington Public Library, AdaptBN encourages Bloomington-Normal residents to discuss the issues with their aldermen.